WFTL, Fort Lauderdale Talk Show Host Joyce Kaufman Honored at Hold Their Feet to the Fire. Some 50-plus radio talk show hosts from around the nation are gathered on Capitol Hill for the annual “Hold Their Feet to the Fire” radio row designed to galvanize both citizen and media pressure upon lawmakers to take meaningful action on immigration policy in the United States. The event, organized by the Federation for American Immigration Reform (FAIR), began yesterday and continues today (4/17-18) conveniently coinciding with the controversial Amnesty Bill currently being pushed through the U.S. Senate by the so-called “Gang of Eight.” Critics of the bill claim that it would have a disastrous effect upon this country’s already-dysfunctional immigration policy and deal yet another terrible blow to the American worker. The radio row is bringing several hundred guests including lawmakers, government officials, experts, law enforcement officers and border state ranchers to the airwaves of America. During the course of presentations at last evening’s cocktail reception at the event, WFTL, Fort Lauderdale talk show host and highly influential Florida political voice Joyce Kaufman (pictured here) was honored as the recipient of one of FAIR’s highest honors, the “We the People” award, for her longtime commitment to and measurable impact upon the immigration reform movement. Media industry and political observers have long recognized the leadership role conservative news/talk radio has played in the immigration reform movement and by the looks of things at this year’s rally this influence is continuing to be a significant factor in the issue. Mr. Larson Goes to Washington. Compass Media Networks syndicated talk host Lars Larson – who’s also regionally syndicated in the Pacific Northwest from home base KXL, Portland – is pictured here (r) with Congressman Lou Barletta (l) at the “Hold Their Feet to the Fire” radio row in Washington, DC. In addition to hosting both programs from Washington yesterday and today, Larson will head to affiliate WCHV, Charlottesville, Virginia to broadcast his programs on Friday, April 19. Dr. Joy Browne Returns to NYC Airwaves. After more than two decades as a staple on New York City talk radio, Radio America-syndicated psychologist Dr. Joy Browne returns to the city’s airwaves on Access.1’s WWRL, New York beginning Monday, April 22. WWRL general manager Adriane Gaines comments, “We are very pleased that Dr. Joy Browne is joining the ‘RL lineup and bringing her on-air advice to our listeners. Joy’s unique blend of wisdom, balance and practical solutions to coping with life’s challenges has made her one of America’s leading clinical psychologists.” Radio America calls Dr. Joy Browne’s program “the longest running of its kind in syndication,” and reports it is airing on more than 125 stations across the country. Odds & Sods. WGN, Chicago partners with the Illinois Department of Transportation to raise awareness for “Work Zone Safety Week.” The photo you see here is the Tribune Tower lit up in orange to help raise public awareness of the construction season and the need to drive safely to help save lives. The promotion also includes WGN’s Allstate Showcase Studio where three interactive kiosks positioned around the tower will accept safe driving pledges and photos that can be taken and shared with loved ones…..CNN Radio’s Emma Lacey-Bordeaux was honored by the Atlanta Press Club on Tuesday, April 16 with the 2012 Excellence Award for her digital/online reporting. Her body of work on Soundwaves, CNN Radio’s audio blog, was cited for the award with a specific call-out on a story about deportation and immigration reform…..WTOP, Washington was honored with six Virginia Associated Press Broadcasters Awards receiving a first place finish in every category it entered. In addition to being honored with Best Website for wtop.com, WTOP was also recognized with accolades in the Continuing Coverage category for “A Date with Sandy,” the Documentary/In-Depth category for “Battleground Virginia,” the Feature category for “Keeping the Drive-In Alive” and in the Editorial category for “Core Values.” The station was also awarded Meritorious in the Feature category for “Commuter Idle.”…..Salt Lake Community College’s The Grand Theatre will be the broadcast site for KUER public radio’s presentation of NPR’s “Science Friday” on April 19, 2013. The live broadcast will be heard by more than 1.3 million listeners via hundreds of public radio stations across the United States. Randall Irmis, Brooks Britt, and science writer Brian Switek will discuss paleontology during the show’s first hour. Irmis is an assistant professor of geology and geophysics at the University of Utah and the curator of paleontology for the Natural History Museum of Utah. Brooks Britt is an associate professor of geological science at Brigham Young University. He is the former director of the Stewart Museum in Odgen, Utah and the curator of paleontology for the Museum of Western Colorado in Grand Junction, Colorado. Brian Switek is a science writer whose new book My Beloved Brontosaurus was released on April 16 by Scientific American & Farrar, Straus and Giroux. Smerconish Continues SiriusXM Show Launch Blitz. During the first week of his new program on SiriusXM’s POTUS channel, talk media personality Michael Smerconish (r) is moving full-steam ahead promoting the switch. 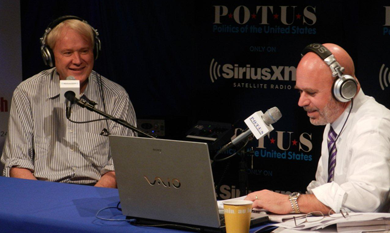 He’s pictured here in the Washington, DC studios of SiriusXM with MSNBC’s Chris Matthews (l) discussing – what else? – the public relations issues the two believe the Republican party is having dealing with the Obama Administration and the electorate. That wasn’t the only issue the two discussed but Smerconish and Matthews spent a good portion of their time analyzing the Republican party of today and comparing with the Republican part of the Ronald Reagan era. Smerconish’s new program airs from 9:00 am to 12:00 noon ET. He left AM/FM radio, including home base WPHT, Philadelphia to join the satcaster. NJBA President Paul Rotella Responds to Smerconish in Letter to Philly Inquirer. In a letter to the Philadelphia Inquirer addressing talk show host Michael Smerconish’s exit from WPHT and move to Sirius Satellite Radio – which Smerconish writes about here — , New Jersey Broadcasters Association president Paul Rotella responds to that editorial expressing “dismay that a former broadcaster could have such ‘sour grapes’ for the industry that has given him some fame and probably some fortune.” Rotella goes on to say that broadcast radio is the standard by which “successful radio broadcasters judge their achievements. Look at Ryan Seacrest, Rush Limbaugh, and so many other radio superstars. They have managed to create vast audience niches that exemplify their talent…they didn’t have to run away from the dial.” No word if the paper will print Rotella’s piece. Boston Marathon Bombing Aftermath, Immigration Legislation, Gun Law Proposals, and Ricin Letters Among Top News/Talk Stories Yesterday (4/17). The aftermath of the Boston Marathon bombing; proposals for new immigration legislation – including amnesty to illegal aliens; proposed gun laws and the defeat of an amendment to extend background checks to gun shows and internet sales that was defeated in the Senate; and the ricin-tainted letters sent to Washington, DC were some of the most-talked-about stories on news/talk radio yesterday, according to ongoing research from TALKERS.